Prototype: 3 different design express train passenger cars, painted and lettered for the German State Railroad of the GDR DDR (DR/GDR) and the Russian Railways (RZD), as a supplement for the Inter-Zone train D 263 Hamburg - Buchen - Hagenow Land - Schwerin - Wittenberge - Nauen - Potsdam - Doberlug-Kirchhain - Dresden. 1 sleeping car (RZD), 1 slumber coach (DR/DDR), and a passenger car, 2nd class (DR/DDR). The cars look as they did around 1976/77. Model: The minimum radius for operation is 360 mm / 14-3/16". All of the cars have imprinted train route signs. These cars are not designed for installation of interior lighting. All of the cars have different car numbers and are individually packaged. There is also a master package. Total length over the buffers 84 cm / 33". This is the right add-on set to go with the 42980 Inter-Zone express train passenger car set and the class 01.5 express steam locomotive, item number 39206. Train route D 263 from Hamburg via Schwerin, Wittenberge to Dresden. 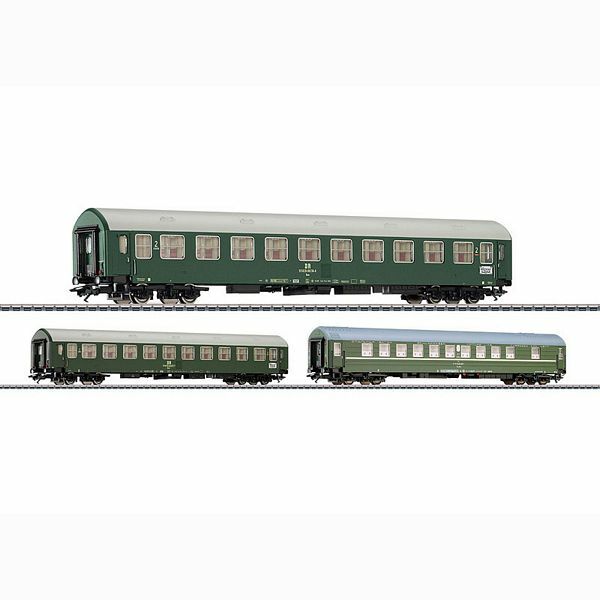 The 42981 Inter-Zone express train passenger car set is the ideal add-on for the 42980 Inter-Zone express train passenger car set that has already come out. The class 01.5 express steam locomotive, item number 39206, also goes well with this car set.